My daughter and I do not know this horse's name. He had just showed us what uninhibited freedom is. He tore up and down the pasture; came up to us and laughed, like he was taunting us to try and catch him. Then he tore away again. 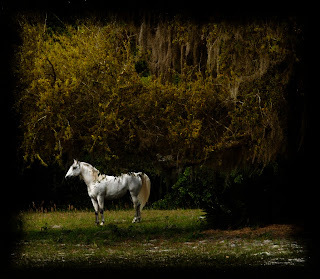 She captured this horse on metal (we used to use film) as he was contentedly surveying his land. Pretty neat.